It's a proven fact that sunglasses are experienced at hiding guilt. If you ever find yourself standing over a dead body with an ax and an overwhelming feeling of regret, I would advise not burying the body under the floorboards of your own home. This is for several reasons. First of all, dead bodies are messy and get stinky very quickly. Secondly, you may incriminate yourself when someone inevitably finds it. And finally, it will drive your pets crazy because there is nothing pets love more than digging up and eating stinky dead things. Also, if you live on the third floor of a building, like I do, burying a body under the floorboards is just asking for your second floor neighbor to wonder why there is a corpse hanging from his chandelier. In case that introduction was not enough of a hint, today's Frightening Friday story is about hiding dead bodies. More specifically, it is about hiding dead bodies poorly and stinking up your entire apartment building. So, grab your can of Glade Hawaiian Fresh air sanitizer and a few towels to jam in the cracks around your door and let's jump right in...TO TERROR. Nathaniel was not an experienced murderer. Oh, sure, he'd thought about it once or twice, like when his landlord told him he would fumigate for rats that time and never did. Or when his cousin showed up to his barbecue empty-handed when Nathaniel had clearly asked him to bring potato salad. But he had never actually followed through with it. So, when Nathaniel really did murder someone, he was quite unprepared. He had not laid down a single sheet of plastic to protect against brain spatter. He had not found a kill room where he would not be disturbed. And, worst of all, he decided to dispose of the body by burying it under the floorboards in his own home. "It'll be fine," he insisted, ignoring all the incriminating bone fragments that decorated his ceiling. "Nobody will ever know that Mr. Dudley was here." Nathaniel haphazardly mopped up the blood pool, put a rug over it, and sat down for a nice cup of tea not five feet from where he had hidden his victim. But you probably need some back story now. It is quite unfair of me to dump you into the best part of the story without explaining how this all began. Not only was Nathaniel an inexperienced murderer, he was also an inexperienced optician. How do you become an optician when you have no experience whatsoever? It's simple, really. Move into an office building and put a sign on your door that says "OPTICIAN." When people who need glasses come in and ask you for your credentials, just show them a brown rectangular piece of paper with some squiggles on it. Then, give them the expected vision tests. After they come pick up their glasses and before they can complain about the headaches, quickly move your offices to a different building. The person cannot see and therefore will never find you. But valuable career advice is unimportant. What's important is how an inexperienced optician was driven to MURDER. "Excuse me," said Mr. Dudley, who would soon become the victim of a very inexperienced murderer. "Can I help you?" asked Nathaniel, who would soon become a murderer with slightly more experience than he had before, which was none. "I bought these glasses from you last week, and they are giving me terrible headaches," replied Mr. Dudley, completely oblivious to his status as a pre-murder victim. "That's impossible!" Nathaniel scoffed. Not only was he an inexperienced murderer and optician, he was also an inexperienced customer service representative and, like the people at Hotwire, he didn't know how to not be a complete jerk. "I assure you that it's not," said Mr. Dudley. "I came in last week and looked at your credentials on that very blurry piece of brown paper. Then, you held up two fingers and asked how many I saw. I picked out some new glasses, paid the price of 8 million dollars, which--as an inexperienced buyer of glasses--seemed reasonable, and left. But yesterday, after I wore my new glasses for two hours, I thought my head might explode." "I understand," Nathaniel said. "But I suspect your problem is that you are an inexperienced sufferer of headaches." "Whatever could that mean?" asked the so-far-inexperienced victim of murder and glasses buying. "I mean that, due to a possible lack of experience in having headaches," Nathaniel said, "perhaps you are not suffering from headaches at all. But maybe you are experienced in imagining you have a headache." "Why would I do that?" Mr. Dudley asked. "Because imagining things is fun," said Nathaniel. "Maybe you would like to experience it now. Go on. Close your eyes and imagine. I will be right over here packing my optician equipment into these moving boxes." But if there was one thing Mr. Dudley was experienced in, it was being distrustful of people putting things into moving boxes. One time, his parents--who were inexperienced at not leaving their children behind when they moved--left him behind when they moved. "How dare you?!" Mr. Dudley, experienced exclaimer of exclamations exclaimed. "I demand a full refund." And it was then that Nathaniel, who was inexperienced at giving refunds, decided to kill him. Soon, Mr. Dudley became quite experienced at being a dismembered corpse. And, if you'll recall, those dismembered parts ended up under the floorboards of Nathaniel's house. Perhaps you are experienced in reading the stories of Edgar Allan Poe and are already aware of what will probably happen next. Nathaniel will soon gain some experience in feeling guilty. The guilt will begin to drive him to madness. He may even start hearing noises coming from under the floorboards. And at the climax of the story, he will declare for everyone to hear that he is, in fact, the murderer of Mr. Dudley. Unfortunately for you, this particular story of body hiding was not written by Edgar Allan Poe. It was written by someone far more experienced at being currently alive and much less experienced at being successful. What actually happened was that everyone who lived in Nathaniel's building soon began to gain experience in detecting odd odors. Ones that seemed to be coming from the empty apartment directly below Nathaniel's. Because, as you perhaps did not foresee, Nathaniel lived on the third floor of his apartment building, not in a place more experienced at hiding bodies, like a mausoleum or Drew Peterson's house. After a week of stinkiness, even the actually-experienced murderer who lived next-door to Nathaniel and kept dismembered heads as trophies on his mantlepiece called the police. And Nathaniel, inexperienced murderer with experience in being caught, was caught. However, all of the detectives who were called in to investigate the crime were inexperienced in buying glasses from an experienced optician and missed the valuable evidence linking Nathaniel to the crime. A mistrial was declared and the prosecuting attorney became experienced in crying a lot. **Credit to whomever Photoshopped the above pic of Poe. ***I keep typing his name as Pie. 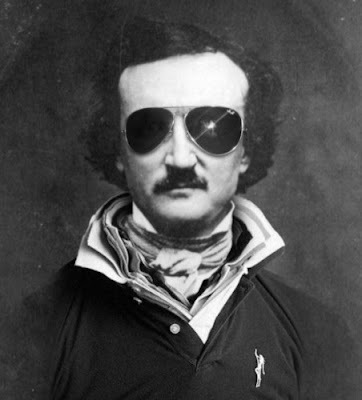 I just had an idea for Edgar Allan Pie. It's a giant pie you trick one of your enemies into climbing into. And then you bake him alive at 350 degrees for 45 minutes. I see more Morgan than Poe in your story. @peach: If it were totally Morgan, I would have made him dump the body into the ocean.